This book has been written by Jon McFarlane who has been investing and trading his own money for over 20 years. In 2008 he set up Systems For Traders, an independent review site for Trading products, with a view to helping others.After over 100 Trading system and Signal service reviews he concluded that to really help others a change in direction was needed. With a view to providing quality trading related courses and resources he founded Forex Useful. 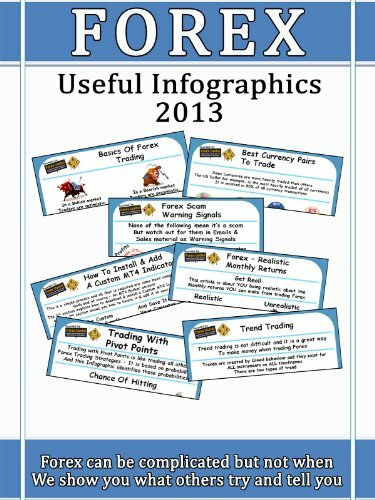 This is a selection of the Infographics from the Forex Useful website and the aim is to provide a comprehensive beginners guide (in picture format) for those considering the world of Forex trading. We hope you enjoy the book and welcome you to visit Forex Useful where you can access many free products including; The 3 Little Pigs Trading Strategy, The Price Action Swing Trading (PAST) Strategy and the How To Really Use Pivots eBook. Content, including strategy updates and new infographics, is updated on a weekly basis. very good beginners guide Great and easy to understand for a beginner and includes simple strategy that would allow you to start trading without keeping it complicated. This book is an entertaining 5 minute read. For the trader, it probably won’t be a lot of use, but as a summary of things that you should keep in mind it can jog your memory. It’s a low key ad for the website, sure, but worthy information in itself.